Aside from adding wood floors and tearing down wallpaper in the eating area and replacing it with paint (which isn't finished just yet), we'll also be updating the cabinetry in my mom's kitchen and building on added storage. Currently the kitchen has an unused space in the corner next to the pantry. The goal is to build on more cabinetry for added storage and replace all cabinets fronts to create a unified look. P.S. That microwave is as old as my sister (29 years). It's a Kenmore, and it just keeps going. And we will use it until it dies. 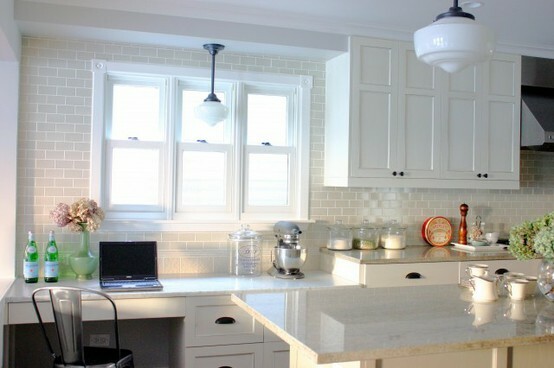 I like the idea of an extended counter top with cabinets underneath and an open space above. This meets our two needs or creating extra storage space while keeping an open and airy feeling in the room. My mom isn't a fan of glass cabinet fronts, but we will be getting rid of the current wood ones and replacing them with white ones, which will also help the space seem larger. Along with the cabinetry, we'd also like to update the backsplash and lighting in the room. I'm definitely digging this subway tile extended all the way up to the ceiling. And of course, you know I love schoolhouse pendants. Taking down my mom's existing fluorescent lights and replacing them with lights like these will be one of the fastest and least expensive transformations we can do in the space. I'm also a huge fan of these iron cup drawer pulls. 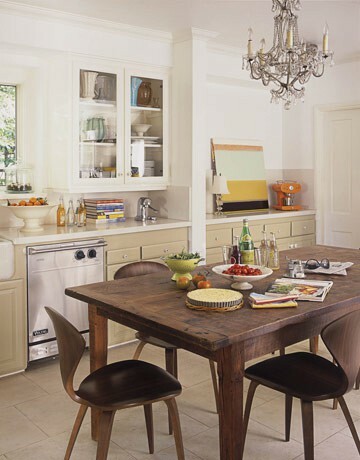 Cabinetry hardware is another way to get a large bang for your buck when updating your kitchen.